I make chia seed pudding alot but this time I made it without any added coconut sugar and some fruit and homemade cashew butter and it was awesome. I'm not usually good at layering everything to look pretty but I must say this is a good picture! Grab some fresh berries and some raw cashews for this recipe and you got yourself a yummy, filling breakfast. 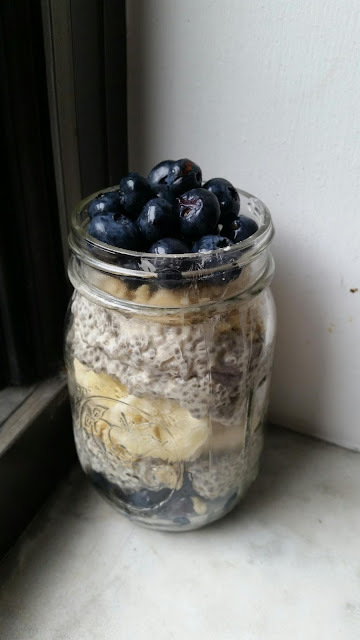 Kids will love this breakfast because it's in a cool mason jar and it's sweet and fun. The possibilities are endless when it comes to making chia seed pudding. You can dress it up as much as you want and it can be a dessert or a meal. You can go the chocolate route with some cacao or chocolate chips, you can make it a berry explosion pudding, you can even add some nana ice cream on top. It's so versatile and chia seeds are so nutritious with lots of fiber, omega and healthy fat. If you have not delved into the chia seed pudding world, you absolutely must do it. Grab a 12 oz mason jar for the pudding and a smaller jar for mixing the pudding and you are set. Put the cashews into your high power food processor and turn on high until the cashews form a butter consistency. You can add a few drops of water to thin out the butter. No need to add any other ingredients. You now have raw, homemade cashew butter. Mix together the milk and chia seeds in the small jar and set in the fridge overnight or for 2-3 hours. Put fresh, organic blueberries into the bottom of your mason jar. When the pudding is done sitting in the fridge, layer a little bit on top of the blueberries. Add some cashew butter on top of the pudding then slice a banana and put on top of the cashew butter. Add the rest of your pudding on top of the banana, then cashew butter then blueberries. And there you have a beautifully presented chia seed pudding and fresh fruit. Notes: the less milk you add, the thinner your pudding will be so I gave a range of how much mill you can add. It will take a few minutes for the cashews to turn into butter so be patient. If you want, you can add a few pinches of sea salt to the cashew butter. You can use any berries for the berry layers or puree the berries to make it a fruit sauce like I did HERE. Are you a chia seed pudding lover like me? Want my recipes delivered right to your inbox? Click HERE to sign up!